When we signed up to run a marathon in Wisconsin, we never imagined it would turn into an opportunity to see Milwaukee’s most impressive succulent display. Two days post-marathon, we limped our way over to the Mitchell Park Horticultural Conservatory. 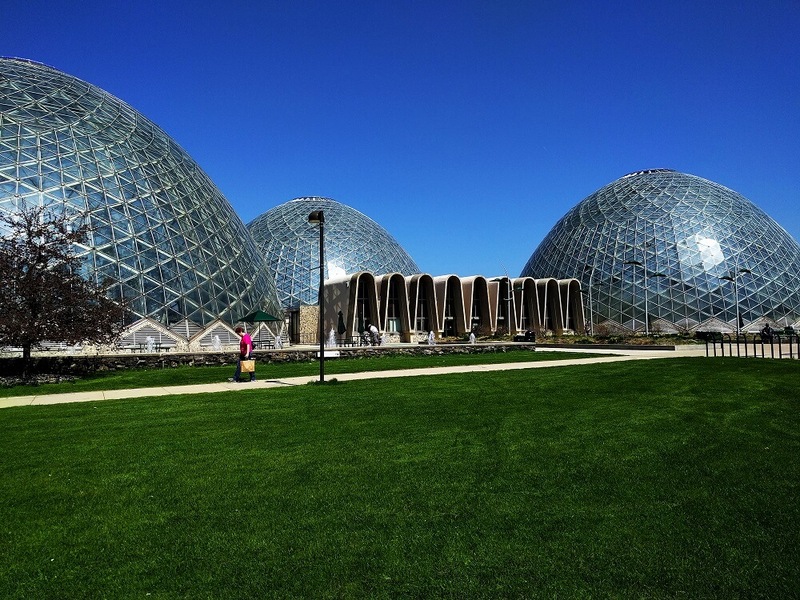 Beneath three gleaming domes, this park showcases a wide variety of plants that wouldn’t survive harsh Wisconsin winters without the assistance of 4 one-million BTU low-pressure boilers and sunlight cascading through the 2200 panes of glass. Also known as the polka dot cactus, the Opuntia microdasys is a flowering cactus native to Mexico and parts of Arizona. 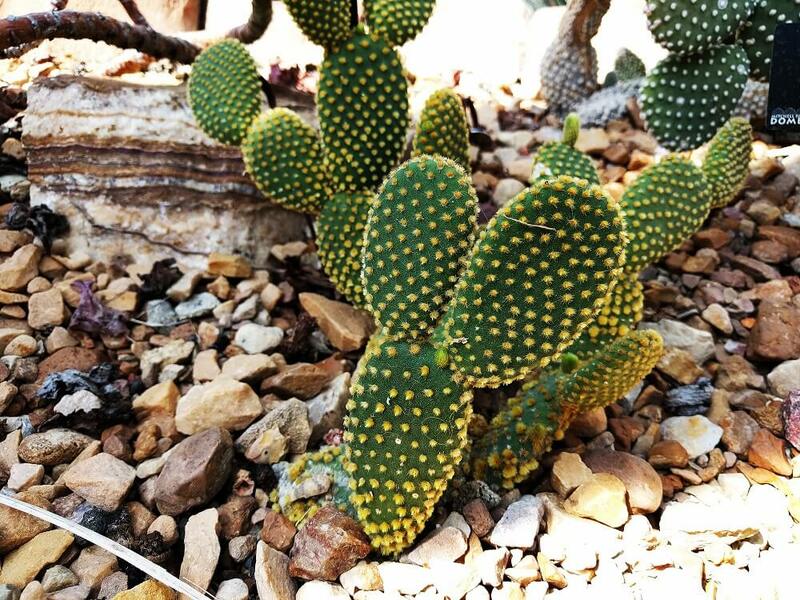 It gets its nickname the ‘Bunny Ear’ cactus because the new pads grow in sets of two, like a pair of rabbit ears. The plant’s glochids grow in orderly rows of dots, like a cheery dotted swiss fabric, and come off easily with a gentle touch or gust of wind. Mitchell Park has examples of both the yellow and white version of this species. Bunny Ear Cactus is a wonderful indoor plant if you can keep the humidity inside your home at bay to replicate desert conditions. You can also grow this plant outside if you live in USDA zones 9-11. This cheery, yellow Bunny Ear Cactus greets visitors at the entrance of the Desert Dome. A favorite of home gardeners, the Burro’s Tail is a trailing succulent with exotic-looking tendrils that can grow several feet in length. The Desert Dome displays this plant close the entrance in a large planter with several stems cascading over the side for dramatic effect. Native to Mexico and Honduras, like most succulents, this plant thrives with ample sunlight and requires warm temperatures. If you live outside of USDA zones 10-11, you’ll want to keep this plant indoors during the winter months, as this is not frost hardy. 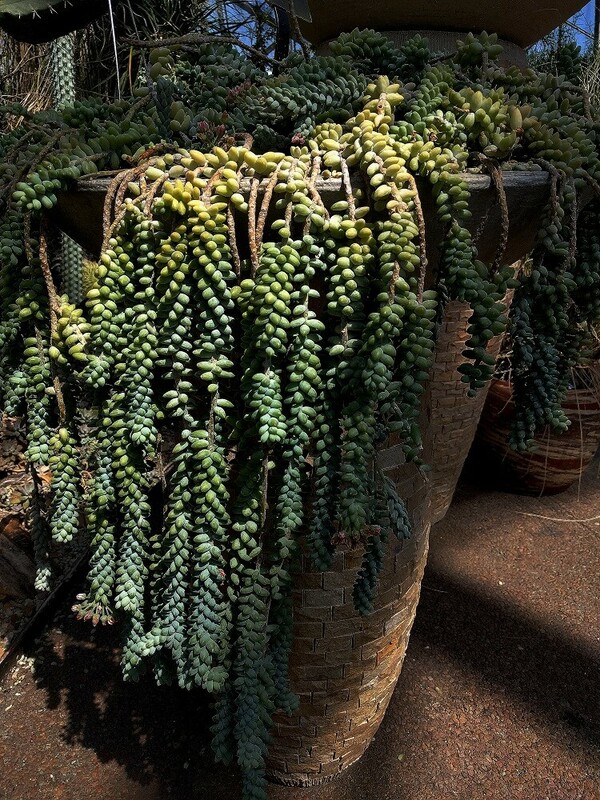 A beautiful specimen of Burro’s Tail cascades over the side of a tall pot. 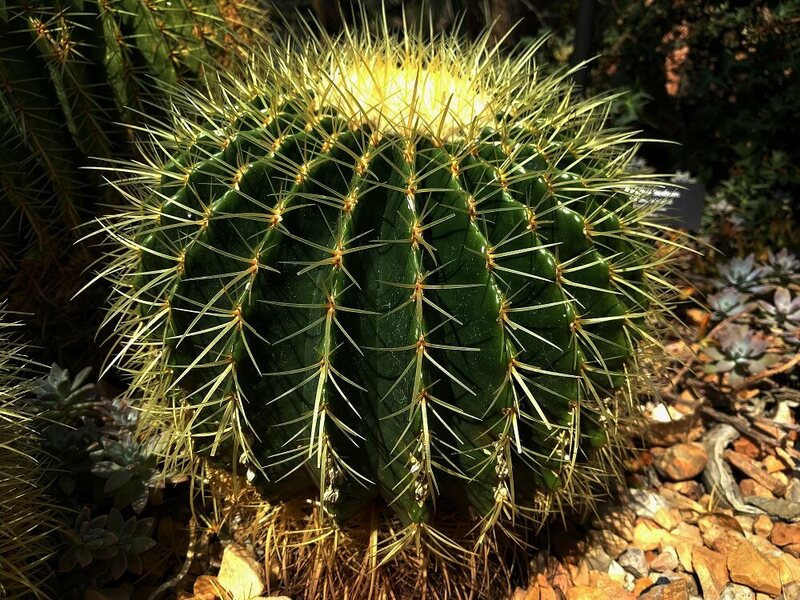 Native to Central Mexico, the golden barrel cactus or mother-in-law’s cushion is a squatty round cactus that is commonly used for desert gardens or xeriscapes because it is low-maintenance and visually appealing. However, it can be started indoors in a pot because it’s also a slow-grower. When this plant reaches maturity, small yellow flowers bloom near its crown, and the ribs grow more defined. Make sure your cactus receives full sunlight and sufficient drainage. This Golden Barrel Cactus, a native of Central Mexico, looks incredible in a desert landscape. 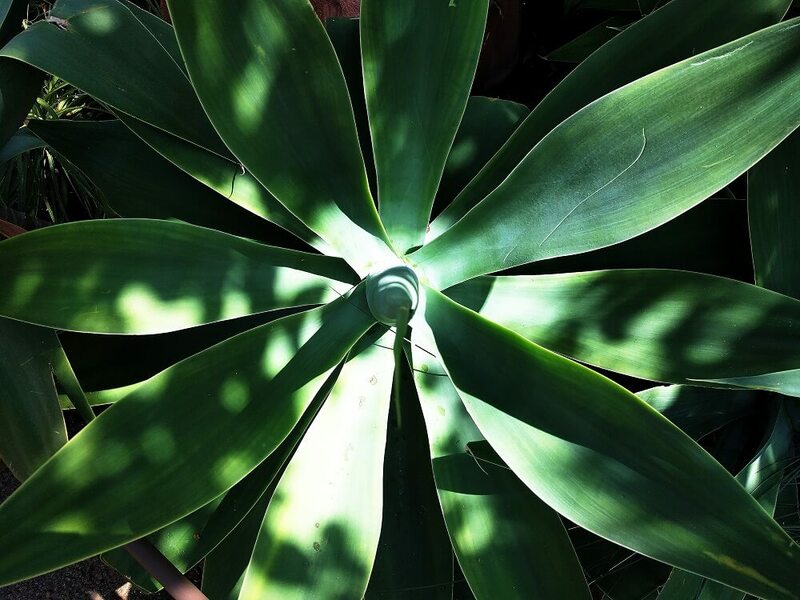 A native to Mexico, Agave attenuata is a perennial evergreen succulent with silvery green leaves that are up to four feet in width. Also commonly known as lion’s tail, foxtail, or swan’s neck agave, this plant takes its colloquial names from its summertime flowering stalk, which can reach five to ten feet high and tends to bend down and arch up again, thus resembling an animal’s tail or a swan’s neck. Though the plant tolerates partial shade, it is best grown in full sun and makes a great accent plant. Keep it out of the frost and propagate it with offsets. Lion’s tail agave can be grown in USDA hardiness zones nine through eleven. The Lion’s Tail Agave is nicknamed for the tail-like stalk that flowers in summer months. 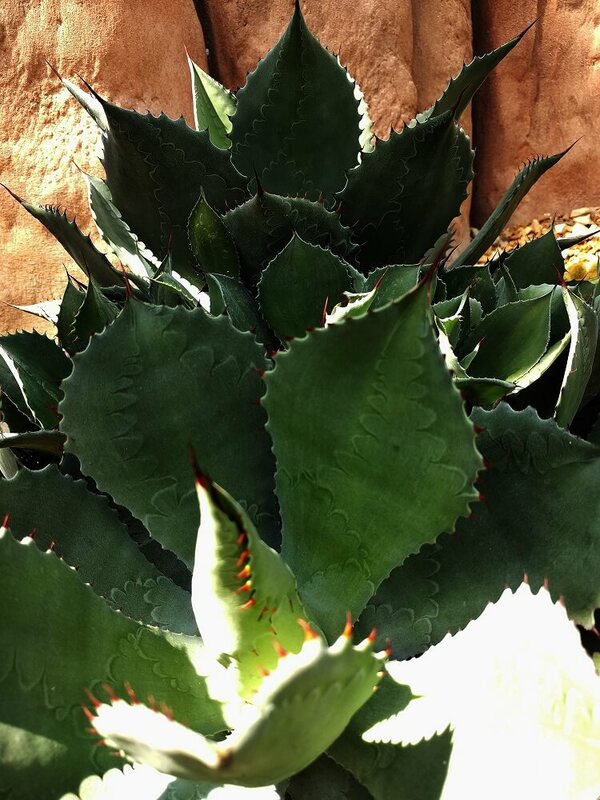 Agave parryi is an herbaceous perennial native to Arizona, New Mexico, and northern Mexico. It boasts spiny green leaves, and suckers root to the rosette’s base to form a colony of rosettes. Each rosette blooms only once every ten to fifteen years, producing a large stalk that gives birth to what the Missouri Botanical Garden describes as “a large cluster of creamy yellow flowers.” Best grown in hardiness zones seven to ten, the plant can reach up to two feet in height and two feet in width. 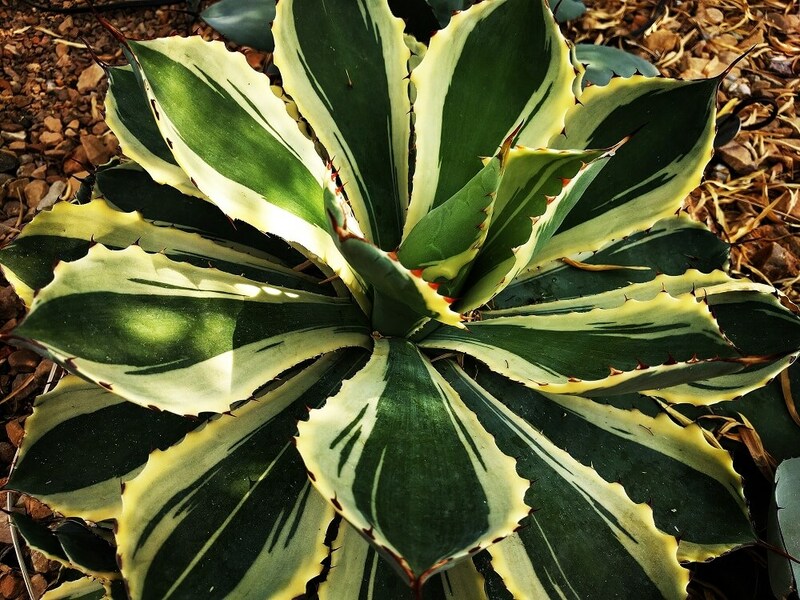 Also known as Parry’s agave or mescal agave, agave parryi prefers full sun and a medium amount of water. It tolerates dry soil and shallow, rocky soil, but it grows best in sandy, well-drained soil. At the end of its life, the Parry’s Agave grows a tall shoot with yellow blooms. Agave potatorum, known in its native Japan as Kissho Kan, can be grown in zones nine through eleven. Ivory teeth-like margins accent the plant’s leaves, which are tinged with a soft blue color. The plant’s spines, which emerge yellow, make it resemble a crown, thus earning its common name of “lucky crown.” The spines later turn a cinnamon brown. Agave potatorum does not exceed eighteen inches in height or width and grow well in a container or rock garden. It prefers full sun and requires only occasional watering. The Lucky Crown is native to japan and enjoys lots of sunlight. Native to the semi-desert areas of Mexico, northwestern South America, and Central America, this evergreen succulent is best suited to zones eight to eleven. Echeveria grows up to four inches tall and eight inches wide and boasts wavy blue-green leaves that remind one of the whirls of a tsunami. In summer, it gives birth to pink and coral flowers. A porous soil is essential for this plant, as in its natural habitat it grows on rocky outcroppings where water quickly drains from its roots. Bright light is also crucial or stretching will occur. Protect your Echeveria from frost and water the soil when it is dry to the touch. The Echeveria tsunami thrives with ample sunlight and well-drained soil. Sedum pachyphylllum is known by a variety of common names, including jelly bean plant, pork and beans, Christmas cheer, and banana cactus. This perennial, evergreen succulent boasts leaning stems of up to eight inches in height with jelly-bean-shaped leaves. The red-brown tips of the leaves turn bronze in summer, and the plant produces yellow, star-shaped flowers. Jelly bean plant can be grown in zones nine to eleven and is native to Mexico. These plants thrive in overly sunny and dry spots of your garden and require little water or attention. The Jelly Bean plant may look like the beloved candy, but we don’t recommend trying it. Notocactus magnificusis commonly called the balloon cactus because of its globular, balloon-like shape. 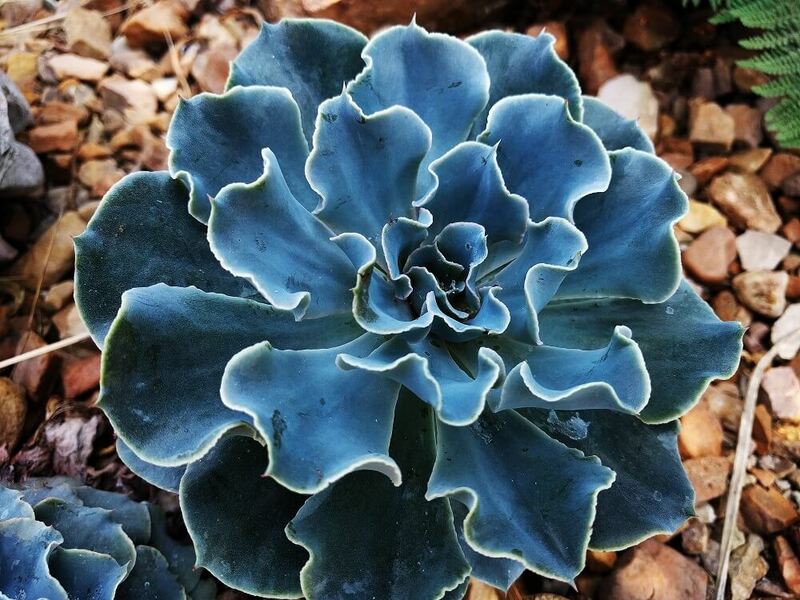 This dark blue-green succulent is native to the temperate regions of southern Brazil and Uruguay. It produces bright yellow flowers in the summer through fall. 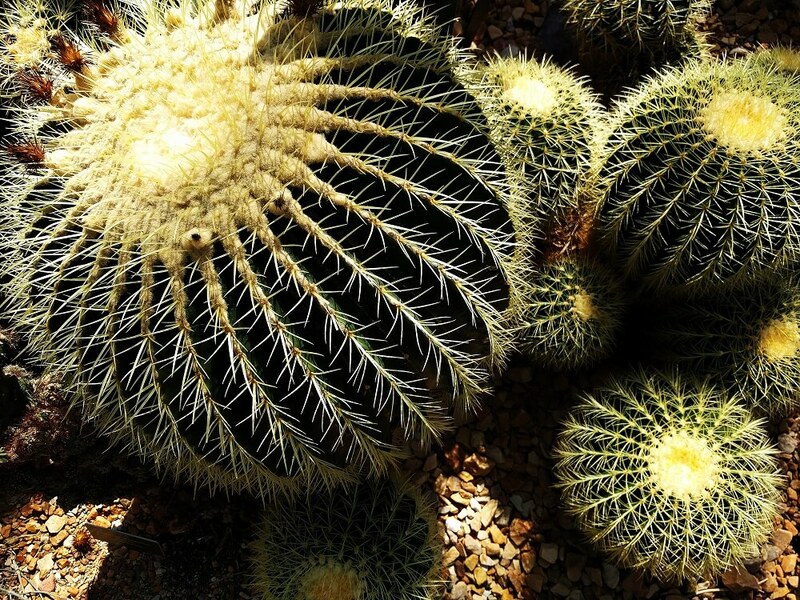 Balloon cactus can be grown year-round in USDA hardiness zones nine and ten, and the plant is especially popular for xeriscaping. Grow Notocactus magnificusin porous soil with good drainage and in bright light with adequate air flow. Protect the plant from frost and water when the soil is dry to the touch. The Balloon Cactus is native to Brazil and Uruguay but also grows well in USDA zones 9 and 10. Crassula arborescens goes by many common names: silver jade, silver dollar, Chinese jade, and money plant, to name but a few. 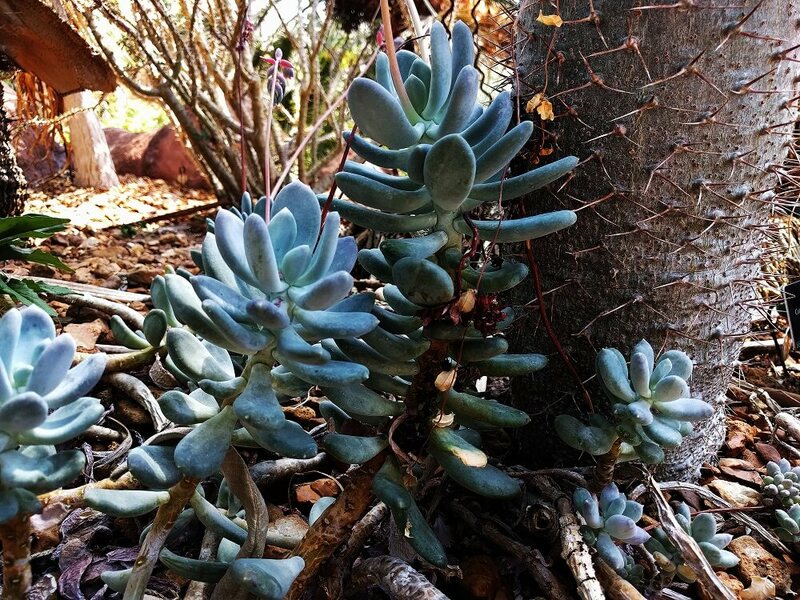 This multi-branched succulent grows up to four feet tall and features large, rounded, silver-gray leaves with a maroon edge. It gives bloom to pinkish-white, star-shaped flowers. 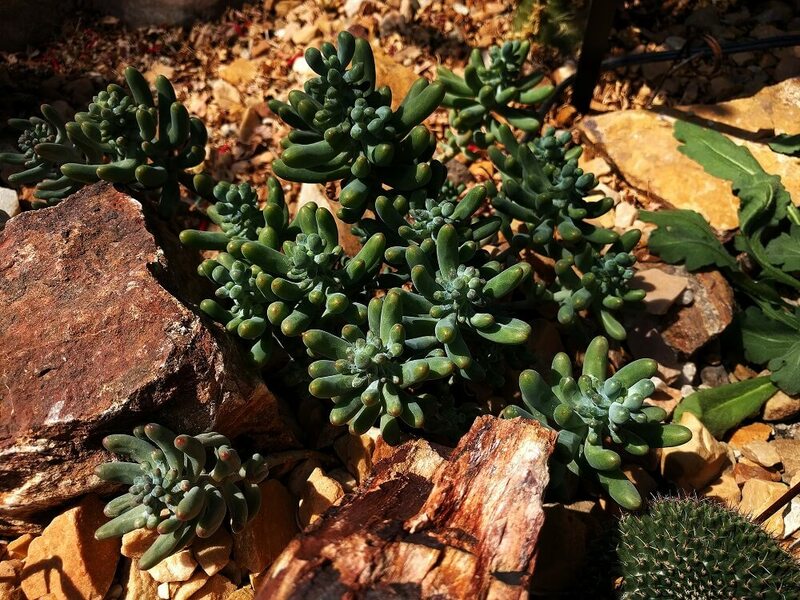 Endemic to the Western Cape of South Africa, silver jade grows best in zones ten and eleven. Keep your silver jade plant relatively dry, as overwatering can be fatal, and do not allow the plant to sit in water. Repot in the warm season and propagate using the plant’s leaves. The Silver Jade plant is also nicknamed the Silver Dollar. If only you could really grow money. Cotyledon orbiculata, also known as round-leaf navel-wort or pig’s ear, boasts rounded silver leaves with red edges that resemble the shape of a pig’s ear. A cold-hardy succulent, pig’s ear blooms toward the middle of summer with red, orange, or dusky pink flowers. Native to South Africa, this succulent can be grown in USDA hardiness zones six through ten. It reaches up to eight inches tall, or fifteen inches when in bloom. 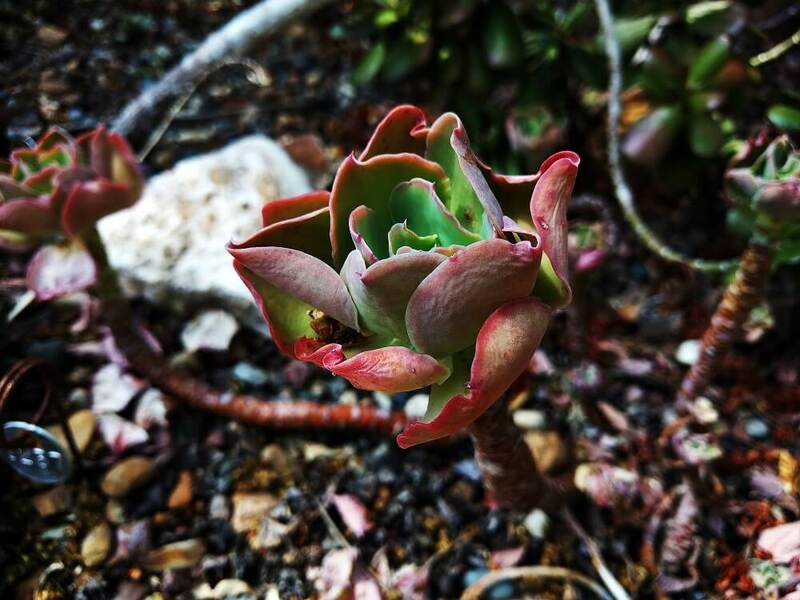 Grow your pig’s ear succulent in full sunlight in well-drained soil and be sure not to overwater. The Cotyledon orbiculata, with its curled ears, bears an uncanny resemblance to a pig’s ear. Pachyphytum bracteosum hails from the rocky cliffs of San Luis Potosi in Mexico and can be grown in USDA hardiness zones nine through twelve. 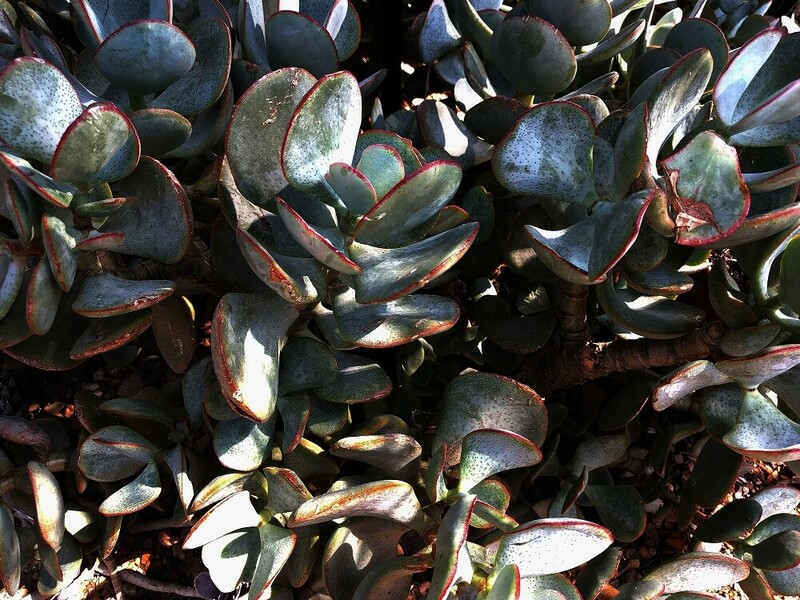 A tender, perennial evergreen succulent, also known as moonstones, this plant features silver-gray leaves that can flush purple with lots of sun. In the spring, the plant’s stalks give bloom to rose-pink flowers. You need only prune this plant to remove dead leaves. Moonstones are disease resistant but watch out for aphids and mealybugs. Grow your plant in well-drained sandy soil and place in full sun. These moonstones have beautiful silver-gray leaves that remind one of the color of the moon.